VAA 35th Annual Juried Open Exhibition, BlueOrange Gallery, Houston, TX March 7 – April 29, 2018. Juror: Molly Glentzer. 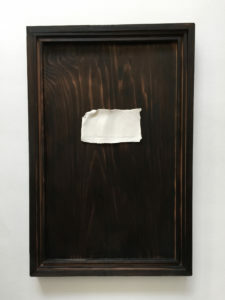 “And We Finally See Each Other” – Fired porcelain mounted on charred wood. Awarded Honorable Mention. Assistance League of Houston Celebrates Texas Art 2018, Williams Tower Gallery, Houston, TX January 17, 2017 – February 23, 2018. 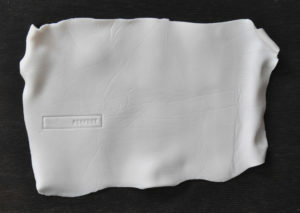 Juror: Anna Katz. 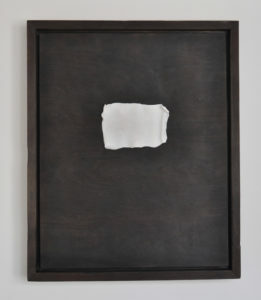 “Drifting, Colliding, Living, Dying” – Fired porcelain mounted on charred cedar frame. 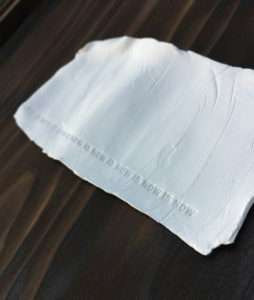 2017 ClayHouston Member Exhibition, TEA + ART, Houston, Texas, October 4 – November 5, 2017. 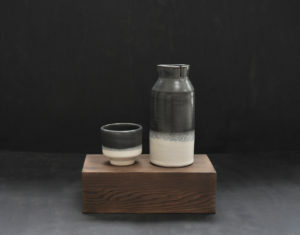 “Tea for One” – Tea carafe and cup on charred cedar plinth. Best of Texas Clay 2017, TPSG Tarrant County College, September 4 – September 29, 2017. Juror: Melba Northum. 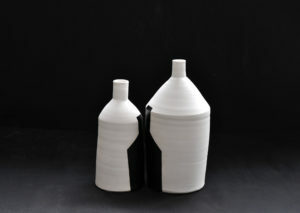 “The Things We Share” – Set of 2 stoneware bottles. Awarded Second Runner-Up. Yunomi Festival, TEA + ART, Houston, TX June – August, 2017. 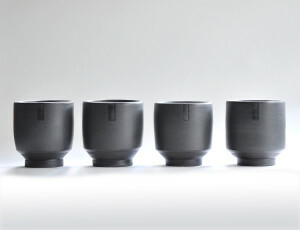 “Land Mass Yunomi” – Three pairs of Stoneware Yunomi with high contrast underglaze detailing. Assistance League of Houston Celebrates Texas Art 2017, Williams Tower Gallery, Houston, TX January 18, 2017 – February 24, 2017. Juror: Jose Esparza Chong Cuy. 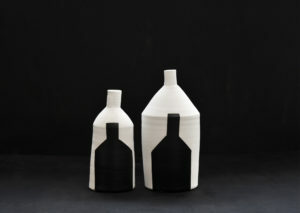 “Wound, Bound and Otherwise Entwined” – Set of 12 Stoneware Bottles Wrapped with Thread. 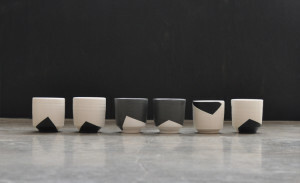 2016 ClayHouston Member Exhibition, TEA + ART, Houston, Texas, November 4 – November 27, 2016. 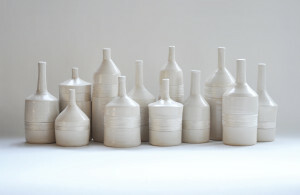 “Parallel, Separate & Together” – Set of 12 Porcelain Bottles. Designed to Dine, Tea + Art, Houston, Texas, October 1 – October 30, 2016. Juror: Lee Garcia. 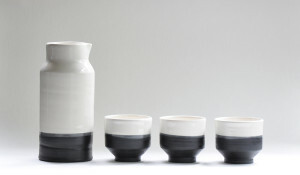 “Tonal Notch” – Set of 4 Stoneware Yunomi. THIRST, Capsule Gallery, Houston, Texas, July 8 – September 10, 2016. Juror: Sarah Sudhoff. 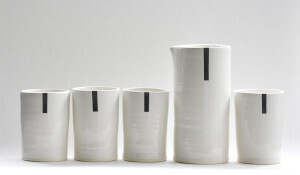 “Notch” – Carafe and 4 Cups in Porcelain “Half Full” – Carafe and 3 Cups in Porcelain. Clay: Body, Mind, and Soul. 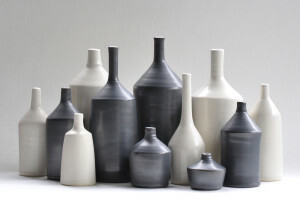 A ClayHouston Biennial Regional Exhibit, The C. G. Jung Educational Center, Houston, Texas, April 2 – April 29, 2016. Juror: Garth Johnson. 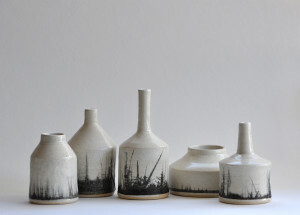 “Salvage and Salvation” – Set of 5 Stoneware Bottles with Decals.